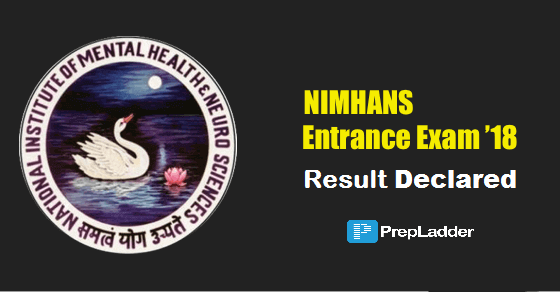 NIMHANS Entrance exam was held 24 & 25 March'18 and all the candidates who participated in the exam were eagerly awaiting the result. The results have now been announced. The results are available in PDF format. It consists of roll number and name of the qualifiers. The merit list is available both course-wise and category-wise. Along with the merit list, a waiting list has also been published by the university. All the candidates scoring more than the cut-off will be considered QUALIFIED. (i) The number of attempts in the qualifying exam. (ii) If the candidates have attempted the same number of questions in the exam, then the candidates securing higher marks in the qualifying exam will get a higher place in the merit. For Non-Medical Courses- NIMHANS will consider marks of all the years/ semesters of the qualifying exam. For Medical Courses- NIMHANS will consider marks of the qualifying examination Final year Part II of MBBS or final year MD/MS. (iii) If the attempted number of questions and marks scored by the candidate are also the same, then, the age of the candidate is to be considered. The candidate older in age will be given higher rank. (iv) If the tie still does not resolve, the candidate with the lesser number of negative marks in the Qualifying exam will be given a higher rank. “Good grades are life’s way of saying that there is a bright future in store of you”. All those who could not qualify NIMHANS Entrance Exam, don’t get disheartened, gear up for the upcoming exams. “Push yourself, because no one else is going to do it for you”.